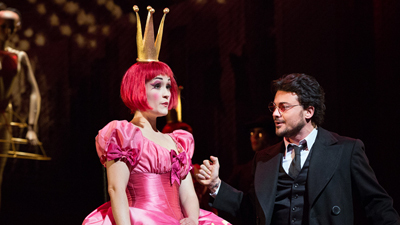 Bartlett Sher’s imaginative production, with sets by Michael Yeargan and costumes by Catherine Zuber, explores all the riches of Offenbach’s fantastical tale. Joseph Calleja is the poet Hoffmann who is enthralled by a variety of women—neither of which turns out to be the perfect creature he envisions. Kathleen Kim scales the vocal heights of the mechanical doll Olympia. Anna Netrebko literally sings herself to death as Antonia and also plays the diva Stella. Ekaterina Gubanova is the sultry courtesan Giulietta. 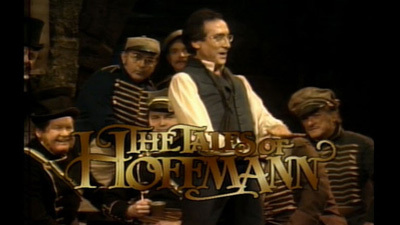 Alan Held’s Four Villains foil all of Hoffmann’s plans. James Levine conducts with ardor and dramatic energy, bringing out every colorful detail of this rich score.